Growing up and living in Chicago my whole life, i’ve had a lot of exposure to some of the best and authentic Greek food around. Most of my classmates in high school were Greek (shout out to Mather High School), and though I wasn’t Greek, my name ended in an “S” (i’m actually Irish) so I was an honorary part of the club. And of course that meant lots of homemade Greek dinners at friend’s houses. Chicago is also home to some amazing Greek restaurants, and, an authentic gryos is never more than 10 minutes away. Once I discovered the Instant Pot and the wonderful meals that can be made by pressure cooking, I set out to see if I could replicate some of that Greek flavor i knew and loved so well. And who else better to help me than my friend, chef Brian. 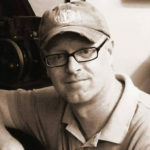 Brian has worked in some of the best local restaurants including one of my favorites in the north suburbs of Chicago. 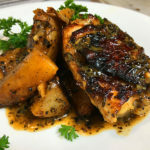 We spoke at length about what the best approach would be to making a Greek chicken dish in the Instant Pot and he came up with a recipe for Greek chicken thighs and potatoes that’s so delicious! This dish starts with an amazing marinade that is mouthwatering even before it cooks with the chicken. The main flavors of the marinade come from Greek yogurt, lemon juice, yellow mustard and white wine. This bright assortment of flavors is rounded out with some garlic, salt and pepper. Let the chicken spend the night in this marinade for a full flavor experience. If you can’t let it marinate overnight, give it at least a couple of hours. Trust me, it’s so worth it. The pressure cooking method infuses flavors quickly into the food in a rapid amount of time. But we’ll also want that all important sear on the outside of the chicken. So what’s the best way to do that? Well, after much discussion, Brian insisted that the chef in him couldn’t let this recipe publish with it calling for the browning to take place at the end. It MUST be seared/browned first. As he explained, waiting to brown the chicken after the pressure cooking would waste way too much of the flavor, and completely miss the complexities that browning and searing add to the flavor. 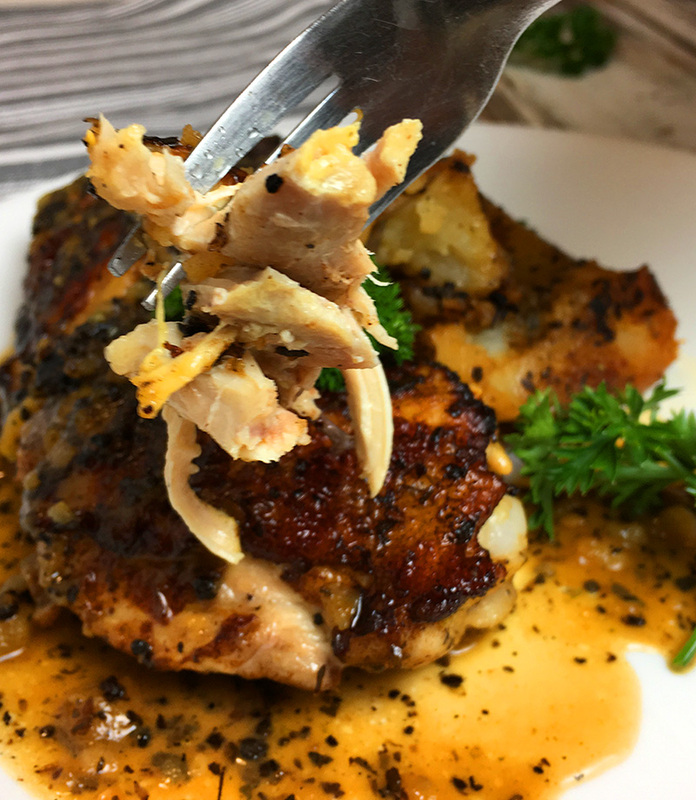 By searing the chicken first, it not only allows the pressure cooking to spread the flavor deep into the chicken, but, it also gives us some important flavors from deglazing the pan, which add so much to the flavors of both the potatoes and the chicken. 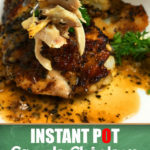 The instant Pot can do a lot of things, including sauteeing and browning foods. But, while that works great for some recipes, for this recipe, doing the searing on the stove top in a heavy pan is not only quicker, but also gives us a much deeper sear and richer flavor. It also make the deglazing components all the better to be part of our sauce. After the chicken gets seared, skin down in a hot pan for about 4 minutes, we remove it from the pan and set it aside on a plate. The, we pour about a 1/4 cup of white wine on the still hot pan and use a wooden spoon to scrape the bottom. This process is called deglazing, and the flavor it produces is magnificent. We set aside the scrapings in a small dish to be added later to the pressure cooking. After we’ve deglazed the pan, it’s time for the potatoes to get a good quick searing. Not too long, only about 3 minutes – just enough to crisp up the outside so it holds up better through the pressure cooking process. Then, everything is ready to go into the Instant Pot. The potatoes go in first, then a cup of chicken broth, then the deglazing juices, then the chicken on top. Pressure cook/manual setting for 12 minutes and then a 6 minute natural release. After the 6 minutes are up go ahead and quick release the rest. Remove the chicken and let it sit for a couple of minutes before serving. After you’ve scooped out the potatoes, the sauce should naturally thicken after a couple of minutes. Be generous with pouring it over both he chicken and potatoes. This is a really good recipe, that I will be making again. I do need to point out there is an error on the quantity of pepper on the recipe vs the instructions. 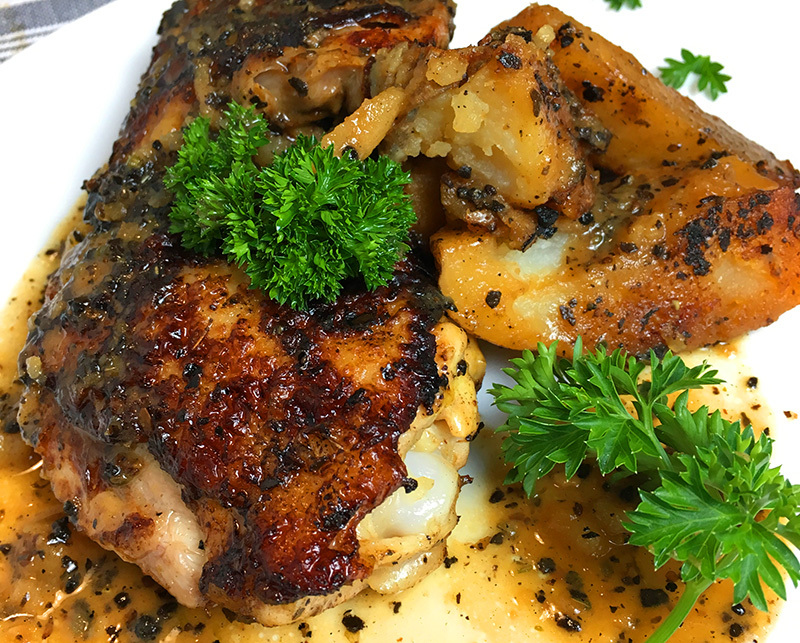 The recipe calls for a tsp divided, but the instructions reference 1 tablespoon pepper on the chicken and a tsp of pepper on the potatoes. Absolutely you can, Tina. Naturally it will miss the flavor it provides, but you’ll still have an excellent dish. Hi Tina. Yes indeed you do them at the same time. 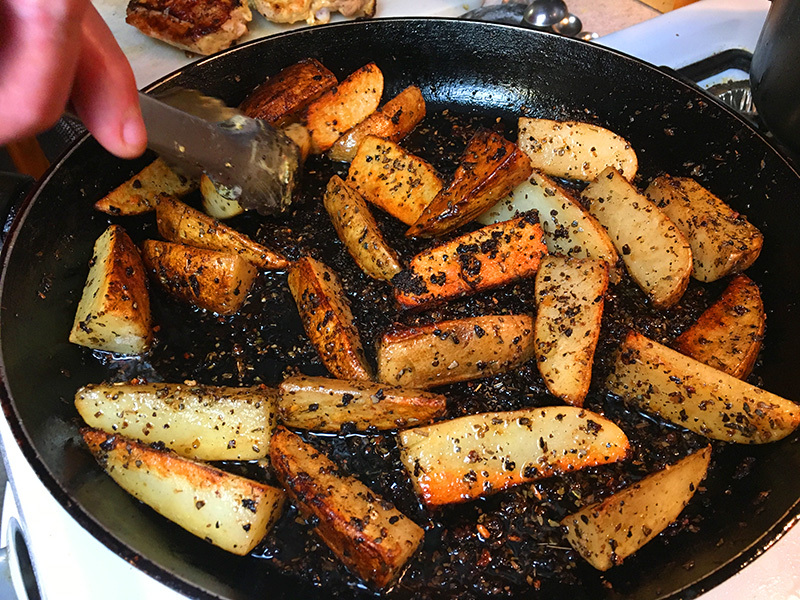 The recipe calls for the potatoes to be browned in a separate pan on stove first, simply because that’s how we achieved the optimal results. But you’re strictly wanting to keep everything in the Instant Pot (which of course many do) then you certainly can. Can’t wait to try! It’s on my list! Thank you for sharing your recipe. This turned out great. My husband and I both loved it. Awesome, Jane! Thanks for the feedback.